Up until recently the independent dealer was heavily relied upon and nearly the sole source of distribution. But things have changed, and it starts with looking at modern consumer behaviour as online shoppers are increasingly becoming more comfortable buying unconventional items over the Internet including bicycles. Technology has also advanced tremendously making shopping online much easier for consumers and vendors to establish themselves. Many manufacturers are taking advantage of this trend by finding alternative sales channels and innovative delivery models to have closer relationships with the end consumer. With the likes of Trek, Giant, and Specialized even seeking to open up stores. Your new competitor isn’t a new shop owner, it’s now the manufacturer. With increased competition from suppliers, what can your shop do to remain not just competitive but win in today’s retail environment? Being able to broadcast your inventory into multiple sales channels is becoming a necessity. If you have inventory available, you need to make it as easy as possible for consumers to find it. That starts with adopting new technologies such as a web-based POS. If you do not, every day you will be having to download inventory and update. It will also not be real-time and have the opportunity to disappoint consumers. 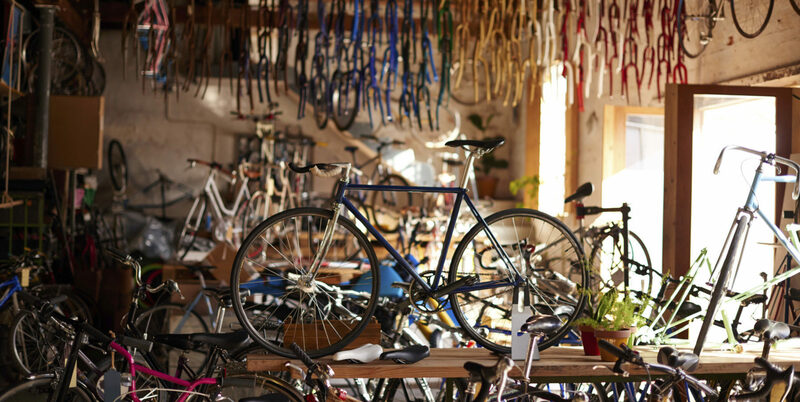 Thanks to Amazon, consumers want products, including bicycles, fast and if you can show you’ve got them on the floor or in your warehouse it has tremendous opportunity to elevate sales activity. Participating in multiple sales channels, including your vendors website increases inventory turnover and visibility of products to the consumer. It also means you are less likely to get stuck with excess inventory that you have to discount, devaluing everyone in the channel. We are in the age of the connected consumer, if you do not find a way to make it as easy as possible for them to buy on their own terms, they will just simply buy somewhere else. Just as how delivery vans are increasing in popularity it is not hard to offer a similar service in your market. Partner with other bike shops and pool your resources in the area to lower costs and share in the profits. After all, other bike shops are not your competitor but should be viewed as partners especially if carrying non-competing lines/categories. Commerce is happening everywhere including on the streets. Being where your customers are is increasing in importance, bring the store to them. Consumers are shifting their spending away from buying physical products towards experiences. Why not make the purchasing journey an experience too? Rather than a visit to your store being strictly transactional in nature, embrace the consumer and let them learn about new products in a way they cannot online. Over half of consumers still prefer shopping at physical retail, don’t let them down by making your store 100% about the transaction. If they want to just transact they would do it from the comfort of home in front of a computer. Consider what you can do in your store consumers can’t get online and offer that to drive traffic. eCommerce is being done very well by brands and Amazon. It’s highly unlikely you will be able to out-perform either as it is their core business. Consider a simple eCommerce store front that can show what inventory you have but most of all, start investing in in-store technology to help your highly educated/trained sales people on the floor sell more. Let’s face it, we’ve all done it and had it done to us. Consumers walking around your store with a mobile device looking for the best deal or the product you have in stock in a different color. Rather than restricting yourself as to what is available in the store let the consumer experience the product and offer to bring it in plus price match if necessary. On most models you should also have a reference as to what other configurations the product comes in to prompt the consumer to ask if they can get their bike in blue rather than red or 8 speed instead of 3 speed. Consider offering up showroom floor space to new interesting brands for a fee where they can get discovered by new customers. Start tracking insights at store level and offer to sell those insights to the brands you carry to demonstrate the value of retail as a service. Too often we see independent bike dealers being anything but independent. With up to 90% of floor space being designated to one or two brands is a recipe for disaster. Keeping your largest vendors honest by carrying a wider assortment of brands is a way your company can stand out and offer something Trek, Giant, or Specialize cannot. Everyone knows and trusts these brands making them easier for the manufacturer to sell online. In addition, these brands are large enough to consider opening their own stores and competing directly with you. Provide an element of surprise and carry alternative brands with unique features consumers can discover offline in your store that might not be on the first page of Google. Opportunities like this give your team the ability to shine in front of the consumer to educate them on alternative products that also have higher margins and keep consumers coming back to discover other innovative products. By carrying craft or boutique brands your store can be a discovery center for new upcoming brands to expose their wares where retail is seen as an experience. At some point retail stopped being about bringing the latest brands and products to market, and more about making easier sales. Retail is changing, but we believe stores still play a very important role in the consumer purchasing journey. Consumers still want to touch and feel products they don’t feel comfortable buying online or to browse new innovative problem solving products in-store. Retailers are curators of new upcoming products that demonstrate trust to the consumer. We all need to re-think retail strategy and get back to the core service of local support and knowledge that helps consumers discover products to solve a need at a fair market price. With large brand names, there is no discovery, it is purely transactional in an Internet age.